That the Plaintiff filed the instant suit praying for declaration and recovery of possession of the scheduled properties. That the suit properties described in the schedule below (the suit properties) originally belonged to one Narendranath Majumdar, and his name was rightly recorded in the C.S Khatian. That while owning and possessing the suit properties, Narendranath Majumdar died leaving Khagendra Majumdar has his sole heir. That on the basis of S.A record, Mr. Abdul Hakim had been paying rents in respect of the suit land. Then in the year 1969, R.S settlement operation began and Mr. Abdul Hakim’s name was correctly recorded in the R.S Record of Rights. Thenceforth, Mr. Abdul Hakim had been paying rents on the basis of R.S record. That on 23rd March 2001, Mr. Abdul Hakim died leaving his wife Mrs. Selina Hakim, and his only son Azizul Hakim as his heirs. That on 5th October 2002, Mrs Selina Hakim died, and thus the Plaintiff became the sole owner and possessor of the suit properties. That having become the owners and possessors of the suit properties, the Plaintiff mutated his name in respect of the suit properties vide Mutation Case No. 453/2002-2003 with the office of Assistant Commissioner (Land), Dhanmond Circle. The Plaintiff also mutated his name with the Dhaka City Corporation. He also transferred the electricity, gas and other utility services in his name. Since then the Plaintiff had been paying all rents and bills in his own names. That since the Plaintiff was busy with his business, he felt it necessary to induct a caretaker to look after the scheduled properties. With that view in mind, at the last part of December 2002, the Plaintiff inducted the Defendant as the caretaker of the suit properties. That the Defendant No.1 was previously known to the Plaintiff since he was son of a distant relative of the Plaintiff and used to frequent the Plaintiff’s house while his father was alive, and the Plaintiff’s father used to provide financial support according to his own means. That at the beginning of 2005, the Plaintiff got a good opportunity for investment in New Zealand, and hence he was required to leave Bangladesh for a long time. As a result, the Plaintiff entrusted all his documents relating to the suit properties to the Defendant No.1 and gave him instructions for looking after the properties in his absence. He also settled that he would send an amount of Tk. 10,000 (Taka ten thousand only) per month as the salary to the Defendant No.1, in exchange of which, he would take care of all the affairs of the scheduled properties on behalf of the Plaintiff and should keep the Plaintiff informed about all the concerned matters from time to time. That having settled such arrangement, the Plaintiff left for New Zealand on 24th January 2005. While in New Zealand, he maintained regular contact with the Defendant No.1 through posts and telephone calls. However, from mid 2007, the Plaintiff lost all contacts with the Defendant No.1. The posts sent to him remained unanswered, the telephone calls made to him failed to reach him. These circumstances raised an alarm inside the Plaintiff who eventually decided to pay a short visit to Bangladesh to find out for himself what went wrong. That on 21st January 2008, the Plaintiff came to Bangladesh and from the AirPort straightway went to the scheduled properties. Upon reaching the cite of the scheduled properties, the Plaintiff found to his dismay that, on the main entrance of the building, a signboard was hanging containing the name of the Defendant No.1 as the owner of the properties. That the Plaintiff went inside the building and found the Defendant No.1 sitting on the veranda. The Plaintiff sought from him explanation for his abstinence form communication with him for such a long time, and also about the hanging of signboard containing his own name in the front entrance. That at this point, the Defendant No.1 told the Plaintiff that in fact, he had purchased the land in December 2000 from the father of the Plaintiff, late Mr. Abdul Hakim. However, Abdul Hakim requested him not to disclose the fact of sale to anyone lest the matter could upset his son and wife. That upon hearing this, the Plaintiff made a search in the office of the Sub Registry, and found that a deed being deed No. 32154 was registered on 29th December 2000 purportedly showing that the father of the Plaintiff had sold the scheduled properties in favour of the Defendant. That it is stated that the father of the Plaintiff had never sold any part of the scheduled property to the Defendant No.1 or any other person. The Defendant No.1 in order to grab the scheduled properties fraudulently created the said deed which does not have any validity at all. That it is further stated that the said forged sale deed has created clouded the Plaintiff’s title over the scheduled properties, and as such a decree of declaration from this court dispelling the cloud is necessary accompanied by a decree directing the Defendant No.1to convey the possession of the scheduled properties in favour of the Plaintiff. That the Plaintiff-Petitioner has come to learn from a reliable source that the Defendant-Opposite Party No.1 is now trying to dig earth of the scheduled properties with a view to making a pond on the scheduled properties. That if the pond is dug the same will severely reduce the price of the scheduled property and will change nature and character of the same. That there is a strong prima-facie-arguable case in favour of the Plaintiff-Petitioner in that there is a serious question to be tried and the issue raised need further investigation. That the balance of convenience and inconvenience lies in favour of the Plaintiff-Petitioner inasmuch as if the pond is dug, the value of the properties will be severely reduced. On the other hand, if the pond is not dug no one will suffer any loss. 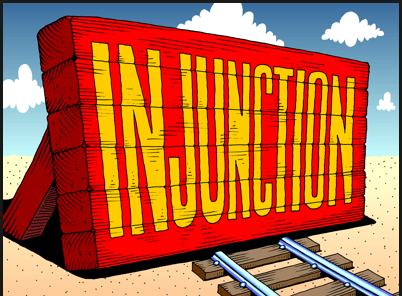 That the loss that will be suffered by the Plaintiff-Petitioner will be irreparable one since no monetary compensation will be adequate remedy since the lot of personal memories of the Plaintiff-Petitioner are attached with this property which would be permanently destroyed. Wherefore it is most humbly prayed that your Honour would be pleased to issue a notice calling upon the Defendant-Opposite Party No.1 to show cause as to why he should not be restrained by an order of temporary injunction from changing the nature and character of the scheduled property unless the instant suit is finally disposed of, and upon hearing the parties, and upon perusing the cause shown, if any, pass an order of temporary injunction. All that piece and parcel of land situated under District- Dhaka, Police Station- Lalbagh, Mouja –Hajaribagh, C.S Khatain No. 343, C.S Plot No. 455, S.A. Khatian No. 233, S.A Plot No. 456, R. S Khatian No. 1098, R.S Plot No. 654, Municipal holding No. House No. 45 Road No.3. measuring an area of 12 katthas of land.